Rep. Ilhan Omar argues that American "democracy is built on debate," tweeting, "I should not be expected to have allegiance/pledge support to a foreign country in order to serve my country in Congress or serve on committee." I'm sure no decent person disagrees with her comment. Also, every sane person understands this is merely a deflection from Omar's many anti-Semitic comments. No one asked her -- or anyone else -- to pledge allegiance to a foreign nation. 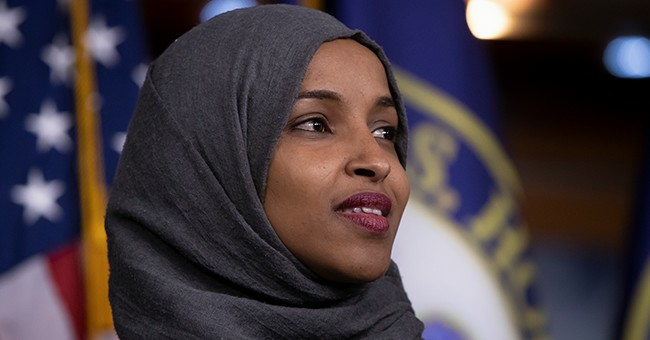 It's her belief that supporting the Jewish state, a longtime ideological and geopolitical ally of the United States, is an act of dual loyalty -- either by Jews or by others who, as Omar might say, have been "hypnotized" to do "evil." She is the one who accuses Jewish Americans, a group that has played a robust role in the nation's civic life for a long time, of doing the bidding of a foreign power to the detriment of their own. Just as no one is forcing Omar to take a position on Israel -- much less pledge allegiance to it -- no one is attacking her right to free speech. This isn't Eritrea -- a country Omar recently visited and was quite impressed by -- where a dictatorship can arrest and torture citizens for taking unpopular positions. If Omar's moral compass tells her to advocate for terrorists and theocrats, she's free to do so. Americans are likewise free to point it out. But Democrats' draft measure condemning anti-Semitism is a useless and transparent attempt to distract from a serious problem of their own creation. The decree mentions Alfred Dreyfus, Leo Frank, Henry Ford and "anti-Muslim bigotry" -- because hey, even when Jews are being smeared, it's about Islamophobia -- but not once does it condemn Omar or the strain of hatred she is helping normalize on the left. The resolution, teeming with useless platitudes, is one that even Omar could probably support. It's also worth remembering that it was only after a handful of Jewish Democrats, such as Eliot Engel, objected to Omar's comments that House Speaker Pelosi was forced to act -- or rather, pretend to act. Even now, a number of pundits on the left, including columnists for The Washington Post and The Atlantic, argue that Omar -- as well as fellow anti-Semite Rep. Rashida Tlaib -- operates within the parameters of acceptable debate. Omar could read portions of the Hamas Charter into the Congressional Record, and The New York Times would tell us her "latest remarks on Israel draw criticism." Another tactic taken up by Democrats is trolling for supposedly anti-Semitic comments by Republicans to deflect and dilute the attention on Omar. This week, Democrats found one such straw man when the ranking member of the House Committee on Oversight and Reform, Jim Jordan, spelled liberal donor Tom Steyer's name with a dollar sign in a tweet. Liberals across the media quickly took up the cause: "Gee whiz, what if Ilhan Omar had done this?!" Well, if Omar had inserted a dollar sign into the name of a Jewish donor, considering her history, we'd have to assume she was clumsily trying to make another bigoted comment. There's absolutely nothing anti-Semitic about calling out Steyer -- and other billionaires who spend millions every cycle helping political causes. Steyer, perhaps more than anyone, in fact, is known for advocating the impeachment of Donald Trump. So when House Judiciary Committee Chairman Jerrold Nadler issued document requests from 81 people and organizations in a massive trolling investigation for "obstruction," Jordan reacted as people in both political parties tend to do, by accusing the other party of being bought by big donors and special interests. Moreover, Steyer grew up with a non-practicing Jewish dad and became involved in the Episcopal Church when he was 40. I certainly had no idea that "$teyer" had any Jewish background. His surname isn't Jewish. He's not a supporter of Jewish causes. If anything, he's been a longtime supporter of anti-Israel candidates and organizations. But Democrats, who hear dog whistles at every mention of "globalist," can't get their ire up when one of their own drops tropes that date back to at least "The Protocols of the Elders of Zion." She did this knowing about Omar's history of anti-Semitic tweets, radicalism and support of Hamas. Last week, Pelosi was mugging on the cover of the celebratory issue of Rolling Stone with Omar and her bestie, apologist Rep. Alexandria Ocasio-Cortez. These, claims the magazine, are, "women shaping the future." If so, that will be Pelosi's legacy.